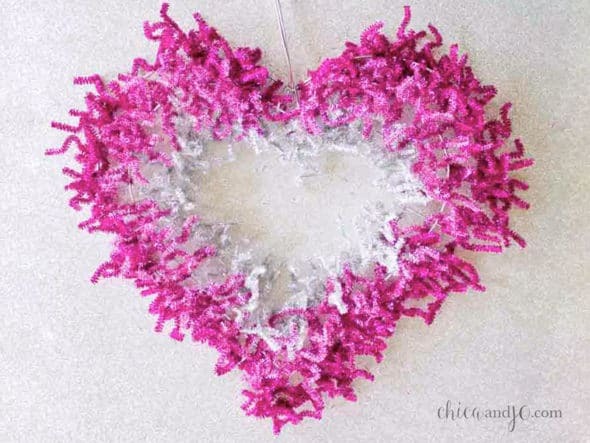 Decorate your home for the Valentine’s Day holiday with these sweet ideas! 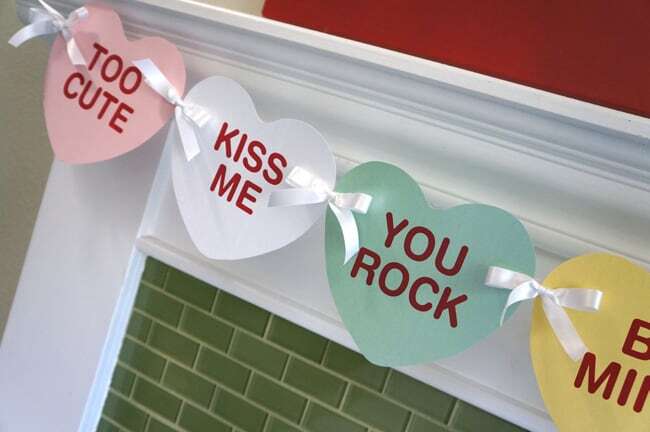 Valentine’s Day decorations bring much needed brightness and color into your home during the dreary winter months-so don’t neglect decorating for this holiday. Plus you don’t need to spend a lot of money or time getting ready for Valentine’s Day. Here is a great list of decorations you can create on the cheap by hitting up your local dollar store. 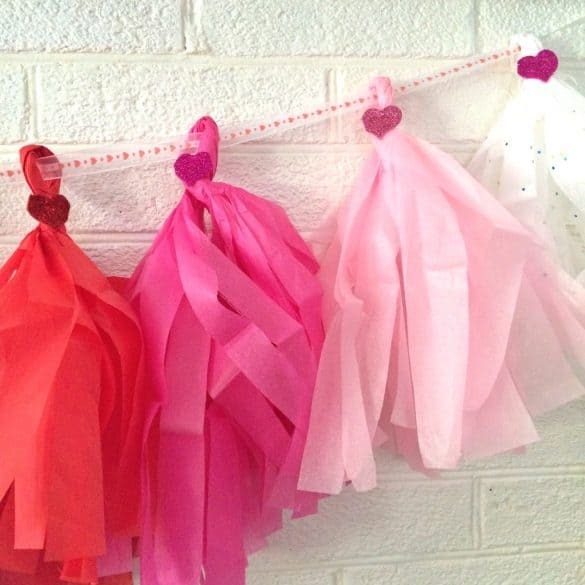 This tissue paper tassel garland from Shifting Roots looks great hanging from a mantle or anywhere else in your home. It’s also cheap and easy to make. 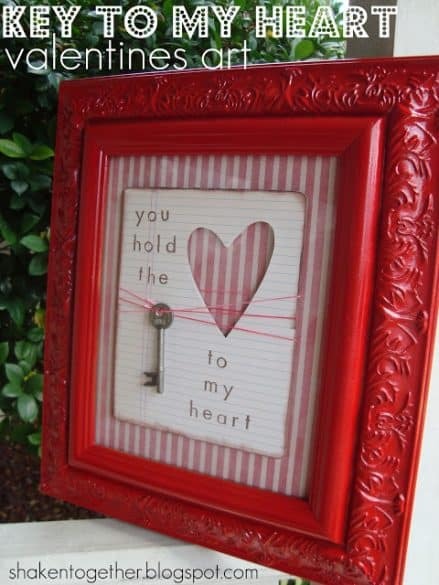 This is a great example of re-purposing an item to make it work for you. Aimee at The Crazy Craft Lady took cheap paper gift bags and turned them into a stunning garland for Valentine’s Day. Check out Chica and Jo’s blog to find out how they made this fun glittery wreath using a wire frame and pipe cleaners! 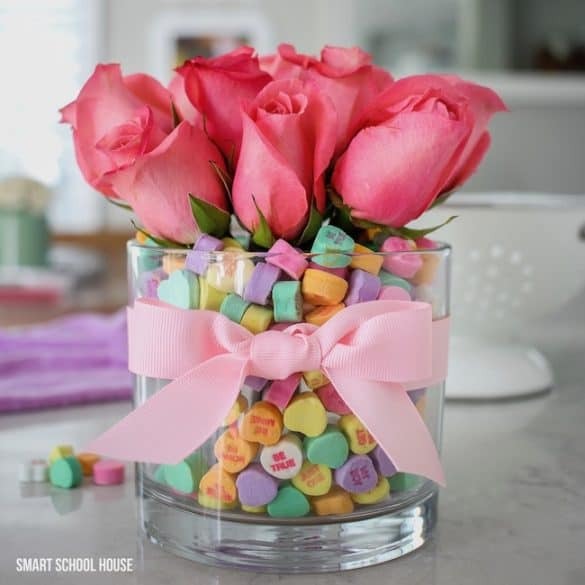 Smart School House came up with this great idea of adding conversation hearts to a vase. She used real flowers, but you can also purchase artificial roses at the dollar store. 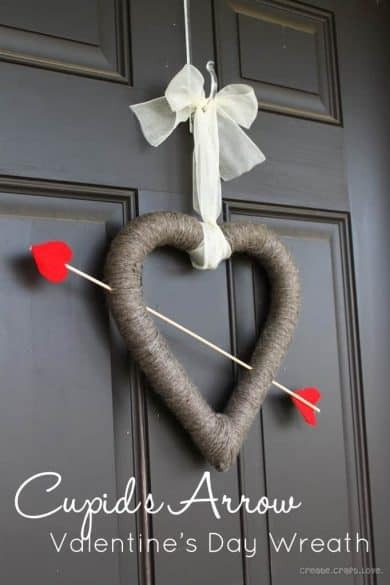 This wreath from Create, Craft, Love would look great on your front door. 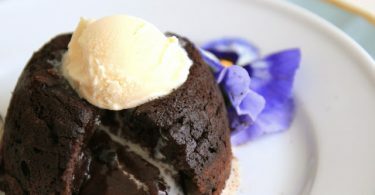 Check out her blog post to find out how to make your own. 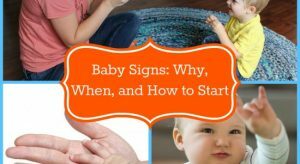 This cute and simple banner is easy to make thanks to Sandy Toes and Popsicle‘s free printable! 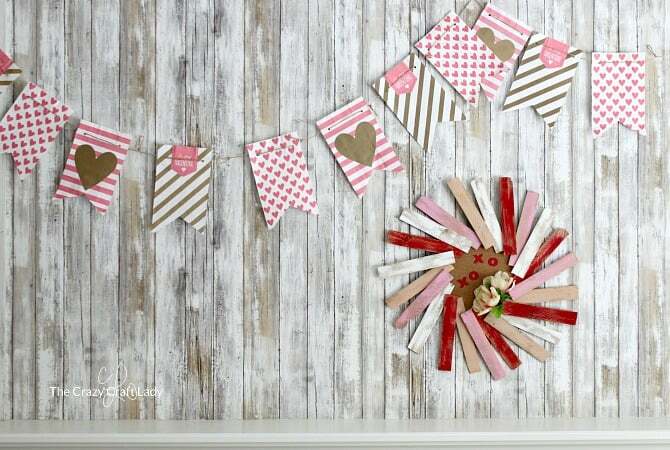 Money Hip Mamas created this beautiful, rustic Valentine’s Day Centerpiece. It’s simple and costs next to nothing to make. 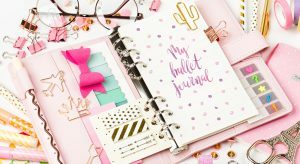 You might not be able to get all of the pieces for this project at the dollar store, but you can definitely get them cheap at a thrift store or a craft store. Plus, it might be worth it to spend a little more for this unique art piece you can display year after year. Shaken Together gives a great step by step guide so you can make your own. 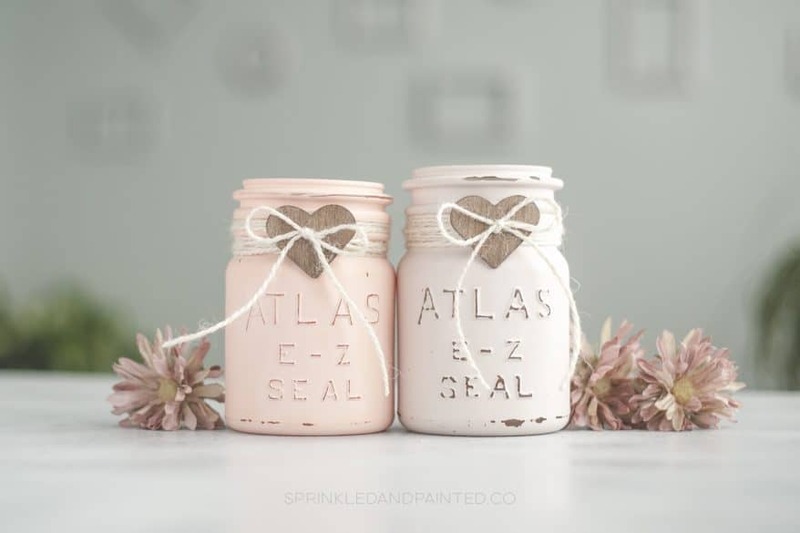 Sprinkled & Painted took regular old jars and turned them into a chic farmhouse decoration for Valentine’s Day. 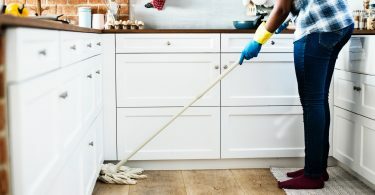 You might not even have to go to the store if you have old jars and latex paint at home. 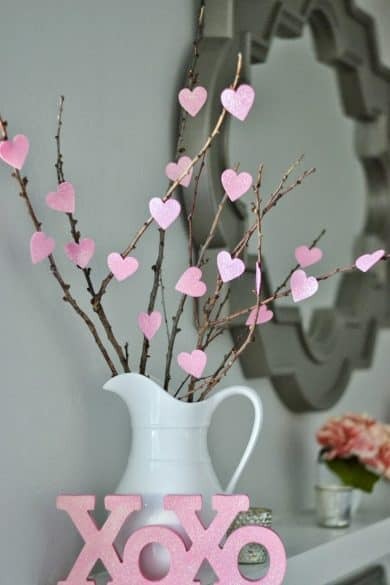 You don’t need to spend a lot of money or a lot of time to add a romantic touch to your home this Valentine’s Day! Hopefully you’ll take on one of these inexpensive projects or be inspired to created something all your own.